I’m using this ‘bright shiny thing’ to encourage readers to read an excellent article* on the BBC website describing this and other data on the recent earthquake. 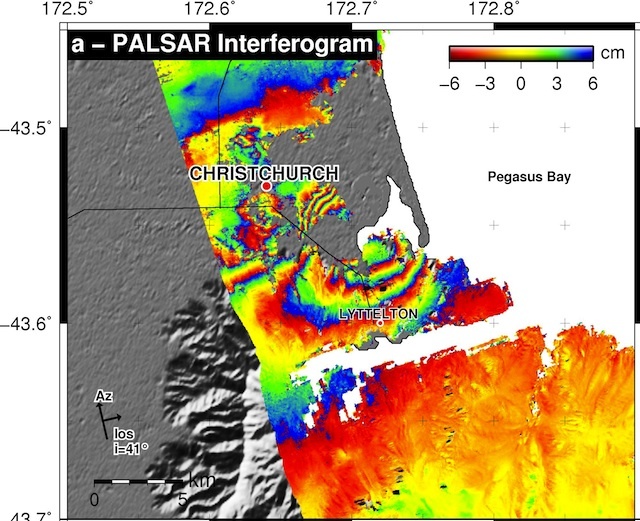 The article has extensive input from Dr John Elliott from the Centre for the Observation and Modelling of Earthquakes and Tectonics (Comet) at Oxford University, UK. Further imagery and background for both the February 22nd, 2011, magnitude 6.3 and the September 4th, 2010, magnitude 7.1 earthquake is also available at the ALOS website. Just from a visual perspective, that is a fabulous image. Brendon is writing from a New Zealand high school that very rarely gets earthquakes. how nuch ground movement was there? i mean how much ground movement was there in the christchurch earthquake? Leon: too childish to accept.